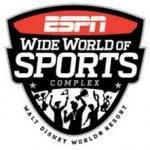 ESPN Wide World of Sports complex is designed to make even the most casual observer's heart skip a beat as you walk into the 200 acre state of the art sports complex in Orlando, Florida. This ulimate sports experience will appeal to the young and old, professional, amateur, and spectator alike. Plan ahead and check what events are on. Take your own food, Disney's ESPN Wide World of Sports can be expensive.